Designer Ann-Marie Powell created the official RHS Garden for the 2016 Chelsea Flower Show, sponsored by M&G Investments. As part of the RHS Vision and Greening Grey Britain initiatives, this garden was intended to build awareness of the positive healing effects that gardening can have on people’s health and happiness. Her colourful front garden design featured bright borders to lift the spirits, benches to relax and share a chat on, soothing water features, a bee-friendly perennial meadow, edible plants in pots and a stylish kitchen garden. The ideas on show were designed to be incorporated in both private and community gardens - great inspiration for visitors to take home. Watch this video to find out more about the garden and how it is bringing together residents of a London housing estate. Award-winning organic gardening expert and author Jekka McVicar designed A Modern Apothecary Garden inspired by conversations with medical professionals about what we can do to improve our own health with the help of plants. Its guiding principle is also the quote by Hippocrates: 'Let food be your medicine and medicine be your food'. Jekka’s apothecary garden was her first Show Garden at Chelsea. It is a small tranquil space with 'wellness' at its heart, and features plants that research has shown to be of beneficial use to the health and wellbeing of society. Jekka created a place of quiet reflection, highlighting the important relationship between medicine and nature, with a lavender-lined path to calm, a water feature and a pair of benches for quiet contemplation. Jekka has been designing, growing and creating herb gardens for more than three decades and has been awarded 62 RHS Gold medals and, in 2009, the Lawrence Medal. This first Show Garden for Chelsea coincided with the announcement that she is now an RHS Ambassador. A key part of our Greening Grey Britain Campaign is about transforming paved-over front gardens into beautiful, planted areas. Our Front Garden Summit aimed to focus attention on the negative effect this has on the environment and our welbeing, and ask: how we can turn our front gardens green again? See our Front Garden Summit debate, which took place on Tuesday 24 May at the RHS Chelsea Flower Show. 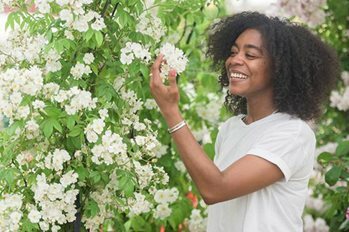 Everything you need to know about this year's show, from plant trends and design ideas to star plants to buy, videos and podcasts. What is Greening Grey Britain? Greening Grey Britain is an RHS campaign to get the nation to transform hard, cold grey areas into living, planted-up beautiful places, to improve lives and help the environment. More than 1,300 people have already promised to plant up an area of grey to green, helping the RHS reach its target of 6,000 promises by the end of 2017.